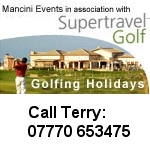 Glen Gorse Golf Club and Mancini Celebrity Events are delighted to once again offer this unique golfing experience, providing an opportunity to play with ex-professional footballers in a team event. The day includes: 11:00 Registration with tea, coffee & bacon rolls, 12:00 Footballer draw, 13:00 Shotgun Start, 18:00 2 course dinner with auction and prize giving for £375:00 per team of 3. For further information or to reserve your team entry please contact Nikki@mancinievents.co.uk 07702 568607.